There once was a city without gardens or trees or greenery of any kind. Most people spent their time indoors. As you can imagine, it was a very dreary place. Amazon’s Synopsis: One boy’s quest for a greener world… one garden at a time. The White House has a neat youtube video about the garden there, it’s history and it’s current state. Why I like this book: I love the message of this book. To be more green, especially in cities is a challenge that all of us need to address. Liam turns a gloomy town into one full of brightness and joy. This book is a wonderful starter in introducing the concept to small children. The illustrations are magical. This book is a treasure! I fell in love with this book when I first read it. I love the message of nurture and caring and how it helps the plants thrive. Then in return how the thriving plants help transform the cityscape and the people who live there. 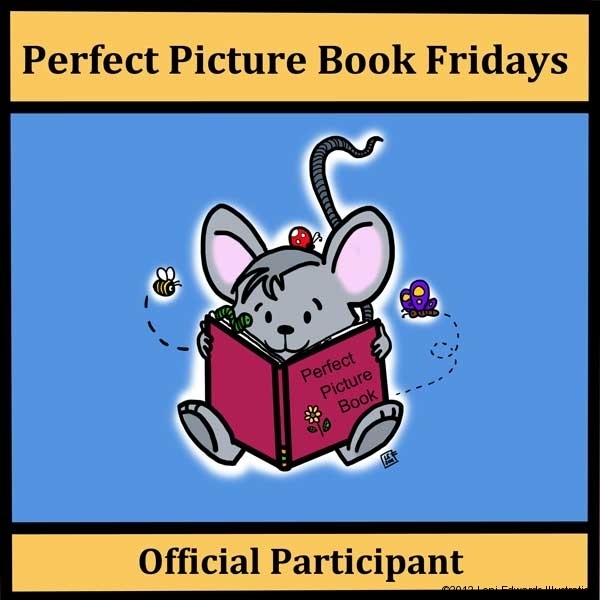 Glad to see this book is now in the Perfect Picture Book Library! Love this message and the idea that a child can have such a big, positive influence on his environment making it a better place for everyone! Yes, it is really fun to see the town transform at the end of the book. Thank you for stopping by! I love Peter Brown’s books, especially this one. Great choice and thanks for sharing. This is my first one I’ve read. I can’t wait to find more though. I love his storytelling and art style! I’m loving the environmental theme of this week’s picks. Fun interview too. This seems like a great fit for my neighborhood. It’s new and needs more green – one garden at a time. I just love the idea of turning something gloomy into something so vibrant. A very cool idea for a story! Thanks for the comment Stacy! I read this book when it first came out and your review made me want to check it out again! Before we moved, we had a nice little backyard garden. My children really got into composting, planting, watering — and of course eating! I hope we can find a nice place at our new house for a garden. Lori, thanks for the review and for liking my post on Facebook today!! Thanks for the comment! We’ve had great fun with our little garden we grow each year. We do square foot gardening and a compost. I hope that you find a nice spot for yours this year! It’s a great learning experience for kids. Isn’t this a wonderful book???? I sold books to public and school libraries for a book distributor for a couple of years. We mainly carried series, but this was one of our single picture books. I loved it and read it over and over. When the next season’s books came out, I donated it to an elementary school library. And I have more to my story. That fall, we celebrated Thanksgiving with my husband’s family. They always have a really large group made up of family and friends. One of their friend’s daughters was dating Peter Brown at the time (I have no idea if they are still dating) and they came to Thanksgiving. My sister-in-law said his name and that he wrote books. I asked, “Is he published?” (I didn’t remember he’d written The Curious Garden). So I googled it and I couldn’t believe it. Is he published???? Is he published???? Oh my!!!! I had just started writing. You will be proud…I mainly listened and asked if he had an agent/editor. I asked a few more questions about his books. But I did not ask to use his name or any of those annoying things. Right after Thanksgiving I bought Children Make Terrible Pets. I went to the library and read all of his other books. I couldn’t believe that I got to meet him. Oh wow Penny! This beats my Pierce Brosnan/Liam Neeson story! AWESOME! Thanks so much for sharing. I just love his stuff. I want to check out Children Make Terrible Pets soon! Loni, This is my kind of book! I absolutely love it and will have to check it out! Is it based on a true story, or just encourages kids to think environmentally? Watched the interview and it was precious. The child was so subdued at first, but lit up with his idea for a book. Loved it! Hi Susanna! You are welcome 🙂 It’s funny, I’ve always wanted to be a city kid, but never really thought about lack of land and vegetation. I think I would miss that. Yes, a roof top garden would be a must for me! Thanks for the comment! This sounds like a great Earth Day selection. I’ll have to share it with my MOMS group when we take a tour of the dump and recycling center. Kirsten, you are right! This would be PERFECT for Earth Day! Thanks for stopping by. I love the idea of this book! As a family who left the city for open green spaces, it sounds like a book we would love. I love the cover of this book and I need to see what’s inside! Thank you for sharing this one and it’s a good time of year to be thinking about gardening season. Hi Heather! Isn’t the artwork awesome? Love it. Thanks for the comment. I love this book too. Great choice! I love gardening. We usually have an herb garden every year. I like your links and I am going to see if the library has the book 🙂 Thanks! Great Erik! Thanks for stopping by. You will love it. I read this book aloud to my students and they loved it! What a cute interview-next time I read this one I will have to show it to the students. Thanks, Loni! That’s great Kelly! Thanks for the comment.